On this date in 1941 Wake Island defenders surrendered after two attack waves of 1,000 Japa­nese each stormed the beaches. Two days earlier, in their largest attack yet on Wake Island, the Japa­nese had sent 49 air­craft, dive bombers and fighters both, to knock out the last of the island’s eight air­craft—this after launching their first air assault (36 bombers) on Decem­ber 8, five hours after their sur­prise attack on Pearl Harbor, Hawaii. (Wake was on the oppo­site side of the Inter­national Date Line.) Three days later, on Decem­ber 11, 450 Japa­nese marines attempted their first landing. They were repulsed by U.S. Marine Corps shore bat­teries and Grum­man F4F Wild­cats, which shot down 24 Japa­nese air­craft and sank two Japanese de­stroy­ers—the first two Japanese warships lost in World War II. Wake Island, a U.S. Paci­fic out­post between Hawaii and Guam, had been iden­ti­fied as a “priority defense require­ment” four months before August 1941, the month building the island’s defenses began. 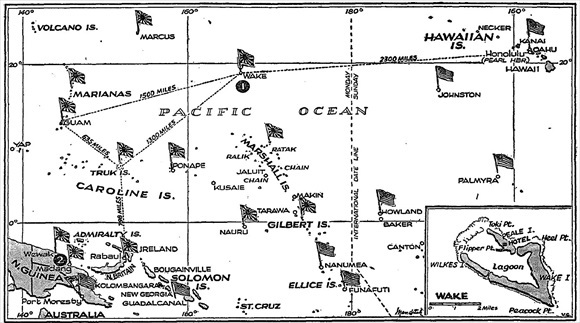 By Decem­ber, Wake had become the most heavily defended U.S. atoll in the Paci­fic. A week after the Japa­nese assault on Pearl Harbor and Wake Island, a U.S. relief force, which in­cluded a carrier with 117 air­craft and 13 destroyers, steamed toward Wake from Hawaii. When the Japa­nese suc­cess­fully assaulted the island on Decem­ber 23, the relief force was still 425 miles away. After eleven hours of fierce resis­tance, the Japa­nese captured roughly 450 sailors, Marines, and sol­diers and 1,150 civil­ian con­trac­tor volun­teers, the major­ity begin­ning 3‑1/2 years of captivity as slave laborers in China and Japan. The POWs who remained on the island were em­ployed by the Japa­nese in building island defenses: con­crete and coral block houses and pill­boxes with inter­locking fire, tank traps, land mines, and barbed-wire entangle­ments along the shore­line, air­craft revet­ments at the air­field, and the like. In Septem­ber 1942 a second batch of POWs was trans­ported to pri­son camps in China. The 98 heavy equip­ment opera­tors who remained were exe­cuted in early October 1943 when the Japa­nese gar­ri­son feared an im­mi­nent in­vasion from a U.S. ar­ma­da that in­cluded the carrier USS York­town and many cruisers and destroyers. The enemy gar­ri­son, num­bering 4,400 army and navy per­son­nel at its height, remained en­trenched on Wake Island through Septem­ber 4, 1945, sur­ren­dering to a detach­ment of U.S. Marines two days after their nation’s formal surrender in Tokyo Bay. Above: Map of the Pacific, circa early 1943. Japa­nese-occupied Wake Island is located in the cen­ter of the map above the black circle enclosing a “1.” To the east of Wake Island the Pacific out­posts are in Amer­i­can hands. Japa­nese island strong­holds lie to the west of Wake and much of the south; e.g., the Marianas, Guam, and the Marshall and Gil­bert islands, which the Amer­i­cans took during cam­paigns that lasted from November 1943 through August 1944. 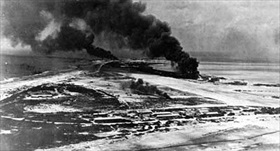 Left: Columns of smoke rise from on either side of Wake Island’s airstrip after a Japanese air attack in December 1941. Right: Just hours after the attack on Pearl Harbor, 36 Japa­nese bombers flown from bases on the Marshall Islands attacked Wake Island, destroying 8 of the 12 F4F‑3 Wild­cat fighter air­craft belonging to Marine Corps fighter squadron VMF‑211 on the ground. 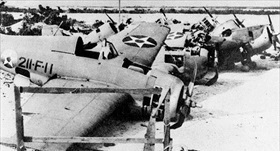 This photo shows the wreckage of Wildcat 211‑F‑11, flown by Capt. Henry T. Elrod on Decem­ber 11, 1941, in the attack that sank the Japa­nese destroyer Kisa­ragi. Elrod was post­humously awarded the Con­gres­sional Medal of Honor—the first avi­ator to receive the medal in World War II—for his actions on the island during the second Japanese landing attempt on December 23. Above: Japanese Patrol Boat No. 32 and Patrol Boat No. 33 were two ex-destroyers recon­figured in 1941 to launch a landing craft carrying a detach­ment of sai­lors over a stern ramp. In the photo on the left the two patrol boats (Patrol Boat No. 32 on the left) have been run aground on the south shore of Wake Island near the air­strip early on the morning of Decem­ber 23, 1941. Island defenders, with a 3‑in gun, drew a bead on beached Patrol Boat No. 33, 300 yards from their posi­tion. Some of their projec­tiles touched off the ship’s maga­zine, and the war­ship began to burn. (Her remains are shown in the right photo.) The illumi­na­tion pro­vided by the burning ship revealed her sis­ter ship, Patrol Boat No. 32, which was hit with 5‑in coastal artil­lery guns. Twenty-five minutes later that boat too was completely demolished.